Would you consider giving up personal data in exchange for a third-party app to show you what your ninety-year-old self will look like? The rise of social media brought lots of joy to consumers’ lives, allowing users to get glimpses of their future selves, to find out their horoscopes, and to communicate with others across the globe. All of this personal data, however, requires companies to take great care in its handling – and recent events have proved that social media doesn’t have a strong grip on consumer privacy. With national crisis like the Edward and the Cambridge Analytica scandal, people are skeptical when it comes to using social media. 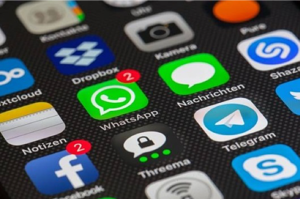 Consumers want to know that their data is protected – and social media apps are finally recognizing this demand and implementing End-to-End Encryption (E2EE) strategies that give their users peace of mind. However, this implementation has the potential downside of making it much more difficult to monitor online criminal activity. What is E2EE and Why is it Important? E2EE is a form of secure communication where messages are encrypted all the way from the sending user to the receiving user so third parties have no way of accessing the plaintext data. The message is completely encrypted while in transit and while being received, and the receiver is the only one that can decrypt the message with special cryptographic keys. E2EE is much stronger than other types of standard encryption because no other entity, including the service provider, has the capacity to decrypt the data. E2EE utilizes public key encryption, also known as asymmetric encryption, to store both public and private cryptographic keys solely in the endpoints of the communication. Public key encryption is much stronger than private, or symmetric key encryption, because only half of the decryption key is transmitted over the network. With symmetric encryption, the same key is used at all endpoints, making it much more vulnerable to unwanted third-party access. When Edward Snowden leaked information about the government collecting Verizon user data, people responded by changing the way they use technology to communicate. Some even switched their entire channels of communication. 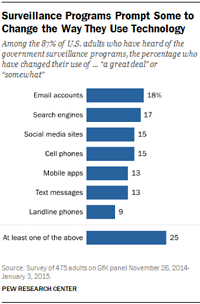 According to the Pew Research Center, out of the 87% of adults who had heard of government surveillance programs, 18% changed their email usage, 15% changed their social media usage, and 13% changed the way they use their mobile apps. These numbers represent a significant shift in public attitude towards social media privacy. The public concern over surveillance and privacy was further increased following the Cambridge Analytica scandal. With millions of Facebook user data exposed, tons of social media sites began to feel the ripple effect and become untrustworthy in the eyes of consumers. 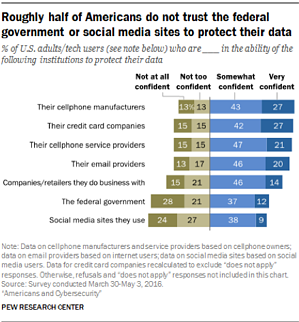 Another Pew Research Center survey revealed that the public has an astonishingly low confidence in the abilities of their service providers to protect their data. Only 27% of tech users feel very confident that their cellphone manufactures and credit card companies securely protect their data, and just 20% feel their email providers are trustworthy. This is an extremely low confidence level for social platforms that serve as the foundation for millions of personal data exchanges. Surprised? We aren’t; according to this survey, only 9% of social media users feel the sites they use are trustworthy. 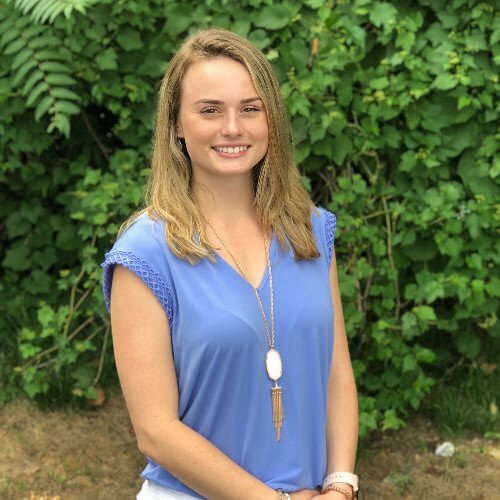 With this unsurprising revelation coming to light, social media companies have begun to standardize E2EE strategies throughout their development processes. Perhaps the biggest benefit around social media encryption is the peace of mind it gives its users; people feel more comfortable using social channels that have a strong encryption strategy. Knowing that your private data isn’t going to be accessed by third parties is a benefitting factor when deciding which social media channels to use. From a business perspective, adopting an encryption strategy is just as much a revenue generator as it is a security measure; people want to use what makes them feel secure. Social media giant Snapchat is the most recent popular app to adopt an E2EE strategy. Though it’s too early to tell, the likely outcome for businesses who have adopted an E2EE strategy will be more usage, which ultimately leads to more revenue. There remains one downside to the heightened social media encryption usage – monitoring criminal activity. Although E2EE is great for blocking hackers’ access to consumer data, it also makes it nearly impossible for law enforcement to pinpoint suspicious online activity or monitor criminal engagement. What’s worse is that the rise of encrypted messaging apps gives terrorist groups more ways to connect. With a plethora of encrypted communication channels for criminals to use, law enforcement will have to rethink their strategy and come up with new ways to monitor online criminal activity. The same lessons learned with E2EE for social media are applicable to any kind of sensitive data, whether it’s a small mom-and-pop business or a global enterprise. Having a rock-solid encryption strategy in place is a powerful failsafe in the event of a data breach. Even if your perimeter is compromised, any stolen data would appear as gibberish to the attacker. Key Orchestration by Fornetix breaks down the barriers that have historically inhibited organizations from utilizing encryption to its full potential. Smart automation and scheduling of cryptographic lifecycle tasks keeps your critical data locked down. If you’re interested in how Fornetix can deploy an effective encryption strategy for your organization, we’d love to schedule a complimentary demo with you.